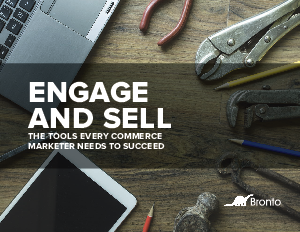 Managing a sophisticated commerce marketing program requires more than a simple email marketing platform. Say goodbye to batch and blast messages and hello to relevance. Today's commerce marketers use an average of 7.2 marketing tactics to grow their business and keep shoppers coming back for more. Are you ready to add a few to your tool box? To build or revamp your e-commerce program, you'll need tools to build subscriber lists in healthy ways, manage coupons, maximize transnational messages, and ping shoppers to remind them about whats waiting in their shopping cart. To stay ahead of the competition, you must also capture browse behavior and create triggered messages to nudge shoppers along in their buying journey, predict what a customer wants and recommend the right product. And, depending on your target audience, you may need to explore SMS.